A busy inbox we have. One of our newest member states in the European Union, Estonia, has a blossoming bike culture and Rasmus sent us this pearl of a shot. Thanks for that. Even though mountain bikes [in urban settings] are so-o-o-o 1990's, the outfit makes this shot. Nice contrast. 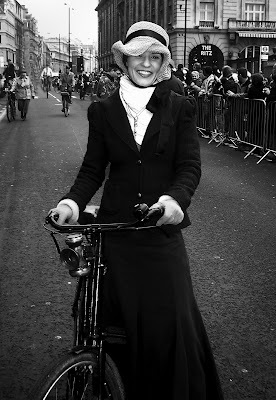 Thanks to Eva for this groovy photo from the London New Years Day Parade where participants dress up in vintage clothes and ride vintage bikes. Check out Eva's cool blog - Cyclepod. Here is a shot of something we see very often in Portland, girls riding track bikes with no brakes. This has caused quite a controversy here due to police citing cyclists for not having a brake, but the lawyers looked closely at the law and saw that it said the vehicle must be able to skid to a stop. Some fixed fear riders can do this and some can't. I ride a fixed gear, with a front brake. I can certainly understand how Europeans see this fixed gear craze and think it's a bit frivolous, but what can I say? It's become part of the culture here. Great shot yet again, Patrick. You're right, it's a strange fad that fixed gear thing. But fads fade. Bikes without proper brakes are not allowed here according to the traffic laws. If bikes are to enjoy an equal footing with motorised traffic then the rules should apply to bikes as well. That's an important step towards bike culture. Thanks for keeping us up to date from your side of the pond! I have a couple of friends who ride single speed (fixed gear) in sydney, and i personally think that are mad. its hilly, they live on the side of a steep hill, and they are ruining their knees. i am also glad to see that Denmark has some intelligent rules about riding without brakes. what happens if you get a flat tyre going down hill? or something blocks your path and you can't stop? riding without being able to stop just seems rather daft. Anyway, love the blog - it is inspiring me to look more stylish when i pull out my red roadmaster. I have watched this silly "fixie" craze take hold in california for a few years now. hills + no gears - brakes = ridiculous. glad the europeans agree. that being said, watching a skilled fixed-gear rider go backwards is quite something. looking forward to studying abroad in copenhagen starting in august! Once a fad turns "cool" it's easy for people to overlook stupid. i suppose the narrow bars lets you ride between closely spaced traffic when you're out with no brakes... oh well, I think I prefer Copenhagen! In the interests of balance, I would like to point everyone in the direction of this article detailing the attraction of fixed-gear cycling . . .
Hopefully tomorrow I will have time to read the oodles of text (it's French after all) of the piece Aaron linked to. But today perhaps a fixed gear aficionado can explain the charm of riding that type of bike in an urban environment. Correction: the piece in roleur isn't french; i got fooled by the web address. For my part the aesthetic aspects of a fixed gear are appealing. A rider in total harmony with the vechicle. I just don't think they should be allowed in urban settings if the bike wishes to enjoy equality in the traffic and gain the respect it deserves as a mode of transport. If I took, for example, the bumpers off my car because I thought it looked cool and reduced the car to something more minimalistic and true to it's nature, I wouldn't get more than a kilometre from my flat before getting stopped and fined. I don't think that fixed gear bikes should be allowed special privileges in the traffic. It's a backward step in creating a true bike culture in cities. For the record, the laws here in Denmark dictate that you must have front and rear brakes. Most bikes come equipped with coasting rear brakes and hand brakes for the front wheel are added. oh it kind of makes me fuzzy inside to hear all of the anti-urban fixed gear sentiments. I just can't believe how terribly ignorant/misguided/un-informed alot of them are. I have a hard time understanding exaclty how excluding an aspect of cycling culture be a step to "creating a true bike culture?" or what the special privelages for fixed gear riders you speak of are? And ontop of all of this, I am hoping that those who have expressed their anti-fixed sentiments have at least tried to ride them. Please don't make blind statements. Welcome to ice and snow with that road bike. I do agree, that in the summertime riding a mountain bike "in an urban setting" or generally on a flat smooth surface is so 90's. But in the winter (defined as "when there's ice and snow"), the mountain bike is much easier and safer to handle than most other bikes -- it has been designed for rough surfaces, after all. I ride one with studded tyres (thinner than normal mtb. tyres, actually) in the winter, and switch to a touring bike for the summer (with a much more stable frame and more comfortable riding position, but not so good to handle on rough surfaces). While fewer people ride when it snows here, the ones that do just ride on their normal bikes. There is no need for different tyres. With that said, the bike lanes are cleared regularly, but on occasion you have to muscle it through several centimetres of snow. 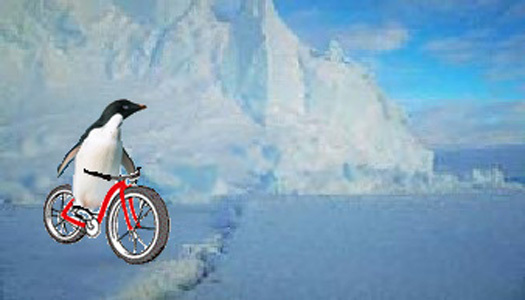 I know my bike well and can adapt to the ice and snow if need be. City bike tyres and all. Regarding your comment, bighead, people aren't necessarily ignorant because they don't share your opinion. 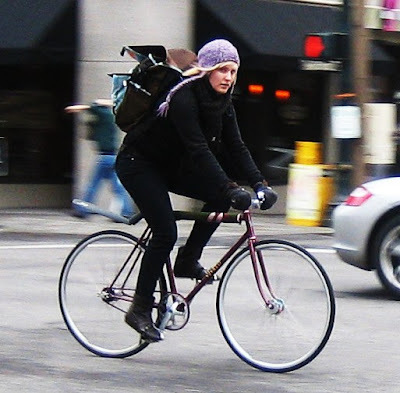 The laws in established bike cultures place the cycle on equal footing with cars. Bells are required, as are reflectors, front and back brakes, lights that meet strict standards, speed limits, etc. Most of the people who visit this blog wish to see a sustainable bike culture, inspired by Copenhagen, implemented where they live. If bikes are to be a part of the traffic then it is only fair that they are subject to the same rules as cars. Then equality and co-existence between cars and bikes can be achieved. No, I do not live on the north american continent. Not all of Europe is a bike/pedestrian paradise. BTW, I do not want cars and bicycles on an equal footing; I want the noisy, smelly and dangerous cages away from my life. are they the Fred Flintstone type of vehicle? I suppose you could still have a fixie but fit it with a front brake? It's the lack of a brake that's the problem. It would clutter up those clean lines I suppose. One day I'll post a pic of my bike. Perhaps we need a 'Readers' Bikes' photo slot on this blog where we can all 'fess up what kind of bike we ride. I'll discuss the idea with the Blog Council of Deciding Persons. I promise I'll dress up! I ride fixed half the time, geared half the time, and front and rear brakes all the time. In fact most people I know who ride fixed do so with brakes and it's the rare few who go without. Anyway, fixie doesn't necessarily mean brakeless. That's a misconception, and the comments here betray a bias that seems based in ignorance and fear like other forms of bigotry. Also, fixed doesn't mean "no" gears (obviously absurd), and you can always gear a bike to suit your terrain and your knees. for the fixie riders, while your rear brake, AKA your legs & the drive train, may be able to skid, it does not have the stopping power required in an emergency. To ride without a separate mechanical brake is foolhardy (and yes, I know many who do and most haven't had serious injury/accident yet, but the "yet" is precisely the issue). But there is a brake. You just use the pedal to brake. At the begining I used to doubt about the its effectiveness. But I got fixie addicted.